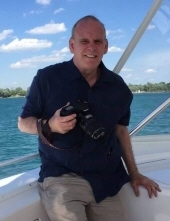 Keith Gary Grebinski a lifelong Metro Detroit resident, passed away at Troy Beaumont Hospital on February 2, 2019 at the age of 59. Keith was born to Thomas and Shelby (Davis) on May 20, 1959 in Dearborn Michigan. Keith graduated from Utica High School in 1977. He then attended the University of Michigan for several years studying Political Science. Keith worked in commercial real estate for many years. He was known for taking pictures always having his camera close by as well as being an animal lover, especially for his Yorkie named Tucker. Keith also had a huge place in his heart for his nieces, nephews, great-nieces and great-nephew. Keith is survived by his father Thomas (Maggie) Grebinski of Bruce Township, brothers Tom and Kevin Grebinski, sisters Cindy Bliemaster and Tracy Boyd, niece Jessica (Chris) Spano, nephew Shane Bliemaster, great nieces Charlie and Lonnie, and great-nephew Ace. Along with other siblings Lisa Wilson, Ed Vermeersch, Gary (Kelly) Vermeersch. Step Nieces and Nephews Ashley, Taylor, Brittney, Cameron, and Jake. Keith was preceded in death by his mother Shelby and step father John Gruber. Local arrangements made by the Henry M. Malburg Funeral Home. To send flowers or a remembrance gift to the family of Keith G. Grebinski, please visit our Tribute Store. "Email Address" would like to share the life celebration of Keith G. Grebinski. Click on the "link" to go to share a favorite memory or leave a condolence message for the family.